Common Enemies is a collaborative project between Subliminal Messages Radio and Classic Blends, created to expose St. Augustine and the surrounding area to the sound of dubstep and bass music. This page will contain info and music from Common Enemies, as well as providing links for upcoming events and mixes from the duo. Below is a snippet from the original press release for the first Common Enemies show, which took place February 17, 2011 at Two Hundred Lounge in St. Augustine. With over 30 years of combined DJ experience, Palazzo and Sumner come from very different backgrounds musically, but found a connection in how they expose people to something they may not have heard before. “Coming from a hip-hop and turntablism background made me hear things a little differently from him, but when the two of us started playing some of our favorite tunes for each other, we knew there was something special in the works,” said Sumner. Sumner, a north Florida native, and Palazzo, a recent transplant from Miami, met through mutual friends in the local DJ community. They have been working together with their respective organizations, Classic Blends and Subliminal Messages Radio, to promote events locally, including the recent 5th Annual Trunk Show, New Years Eve Masquerade, Classic Blends’ annual Back To The Old School party, and weekly events like Hi-Fi Fridays. Classic Blends is a production company owned by Hugh Ward, a Flagler College Alumni, which specializes in events, design and marketing for local businesses. For more information, visit www.facebook.com/classicblends. Subliminal Messages is a radio show, on-air for over 13 years, hosted and produced by Steve Palazzo Jr., which focuses on electronic music and culture. 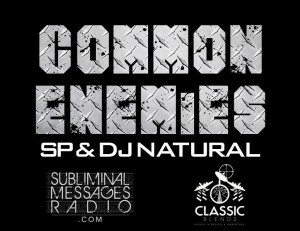 For more information, visit www.subliminalmessagesradio.com. Common Enemies 2 is in development now… stay tuned for more information on that show as it becomes available.